The Best Tasting Carrot Soup! 1/2 cup (more or less) of fresh or from-concentrate orange juice, to taste. You should be able to 'detect' the orange juice, but not be overwhelmed by it. 1. 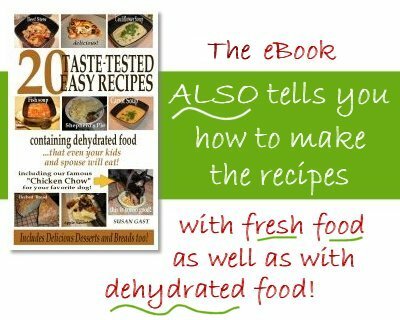 Re-hydrate the dehydrated carrots, dehydrated onion, and the dehydrated garlic with clean cold or freshly boiled water. 2. To a good heavy pan, add the olive oil, medium heat. 3. Add the onions and carrots and cook until softened, around 8 minutes or so, then add the garlic and the oregano, and cook some more for a few minutes. 4. Add the vegetable stock and bring to a boil. 5. Simmer for 10 minutes or until the carrots and onions are cooked through. 6. Add the orange juice, stir. 7. Use a blender to mix, in small batches ... allow air to escape from the little hole in the lid so that the heat doesn't cause any explosive problems! Just have your hand over that top little hole to catch any runaway splashes. Blend until smooth, about 45 - 60 seconds. You can also use a “wand/stick” blender, but make sure that you’re not using a non-stick pan or your “best pan” at this stage, otherwise the hand-held stick blender head may scratch it. 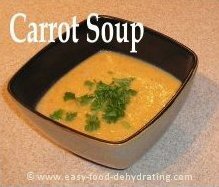 ENJOY this fantastic good-to-the-last-drop soup ... not only for the sheer taste of it, but the goodness of the beta carotene it contains too! It's my dad's FAVORITE soup that I make! Please check out our other soup recipes over on our main recipe page. How about celery and potato soup? Or lentil soup? Yummy! All of these dishes contain dehydrated food components. If you want to make these dishes using fresh ingredients, pick up a copy of our Recipe eBook. In it we list the fresh ingredients in lieu of dehydrated. Thanks.